The small promontory at the end of Tingwall Loch, known as Tingaholm or Law Ting Holm was once home to Shetland’s earliest parliament. It was once an islet entirely surrounded by water and accessed by a stone causeway. 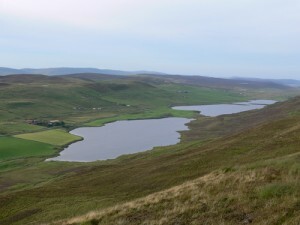 In the 1850s the level of the loch was lowered, and the holm took on its present form.